Lot of things in life go hand-in-hand; peanut butter and jelly, hayrides in the Fall and beach hair in December? You may not agree that the perfect, sun-kissed waves the ocean gives our hair on those warm Summer afternoons are even possible in the dry and cold Winter, but after using the recipe I found for a DIY salt spray, I’m convinced you can have beach hair no matter how far the ocean, or how cold the temperature outside. This was probably the simplest thing I’ve ever made with the quickest satisfaction rate. It is ready to use as soon as you make it and it lasts forever! The same product you would buy in a drug or beauty store would cost at least $13.00 and this one costs about $.90 to make with a ridiculous amount of leftover supplies. Disclaimer: I did not make the candle. That is purely there for aesthetic (and to help you know the scent of the body scrub). How will you end up looking like a surfer on a smoke break? You can funnel a half cup of warm water into the bottle if you want to be exact, but I thought it would never be worth the stress of finding a funnel, so I went for the old-fashioned approach of just filling up the bottle at my sink. I filled it about half way leaving room for the other ingredients. Add in both salts, cap the bottle and shake well to allow the salts to dissolve. Then add in the melted-down coconut oil and hair gel and shake once more. I decorated the bottle a bit after so that I could keep it on display in my bathroom, but after you have the product made it’s pretty much a free-for-all. You just spray, scrunch, repeat! Or just put your hair in a flip bun, spray a generous amount on top and wait until it dries to let down your locks and check out the sandy-shored curls. The other concoction I whipped up once I realized I had enough sea salt to last my entire life, was a vanilla exfoliating scrub. Again, this is another super simple DIY beauty recipe with a lot of benefits including but not limited to circulation, dry skin, mineral or vitamin deficiency and relaxation. A mason jar, sea salt (or epson salt; you could also use raw sugar), iodine salt, olive oil, an essential oil of your choice (you could also use an extract if you didn’t want massage properties to the product) and lemon juice to reduce any black spots or scars on the skin. What you’ll need to make this sugar cookie goodness in a jar? In a small bowl mix together both salts with two tablespoons of olive oil until completed coated and wet, it should have the consistency of wet sand. Add in the remaining ingredients and my secret weapon *a few sprinkles of cinnamon. The cinnamon will give the scrub it’s desired collar and a richness to the scrub. It’s also known to invigorate and will serve as an energizing aspect. Again, I decorated the mason jar to give a cohesive theme to both of the things I made, but it’s really as easy as mixing things together. You should apply the scrub at most, twice a week in the shower. It will leave your skin smooth and exfoliated with an amazing scent. Great idea! Is the salt spray for a specific hair type? Thank you! As far as I know, it works on any hair type. I have long, thicker hair and it’s worked like a charm so far. I think it would probably enhance curls too! can’t agree more about peanut butter and jelly! 🙂 I use argan oil in my salt body scrub and it’s amazing too. 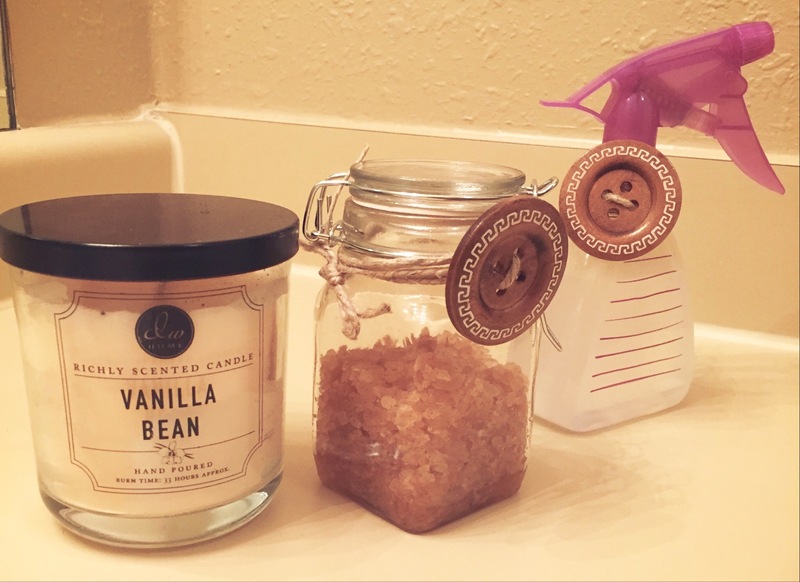 A drop of vanilla essence sounds heavenly – feeling inspired to try this! Who doesn’t love some pb&j?? Glad we’re on the same page with that! Haha. The Argan oil is a great idea as well! Thanks for reading. Thank you for sharing you diy. It’s nice that you put coconut oil, it make hair shiner and smoother. Thanks for reading! The coconut oil is definitely a good trick 🙂 Let me know if you make it and what you think of it!